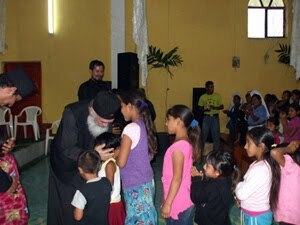 Thirteen years ago, when I undertook the (then newly-established) Holy Metropolis of Mexico with only three priests and three mainly Greek-speaking communities, in Mexico, Panama and Venezuela, I would never have expected, let alone conceive the miracle that is unfolding today for our Orthodox Church in Latin America. We all lived the miracle of Cuba, when Fidel Castro's government undertook the construction of the Sacred Temple of Saint Nicholas in Havana and officially received Ecumenical Patriarch Bartholomew, who officiated the inauguration of that Holy Shrine in January of 2004. In the decade that passed, we experienced the propagating of our faith in the states of Mexico, Colombia, Costa Rica, etc... just as we experienced - and continue to experience - the continuing drama of the people of Haiti, after the catastrophic earthquake of last January. A drama which unfortunately will heal, only after several years have passed. Greece became acquainted with Christianity and lived its own Pentecost around two thousand years ago, through the Apostle Paul and the other Apostles. Greece is the most blessed country in the world. And this is because - as I point out to our priests - whichever stone you lift, underneath it you will find the relics of a Saint, a Martyr, a holy man, a fighter for the Orthodox faith... We, however, in Latin America are living our Pentecost today. 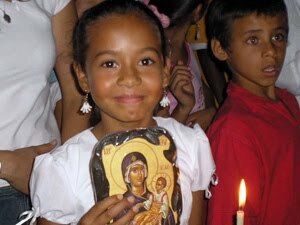 For us - with the exception of the few Greek Orthodox Communities - Orthodoxy has only just arrived in Latin America. 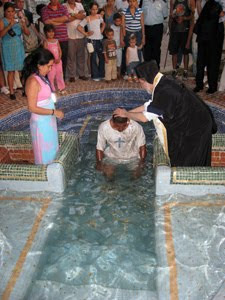 I recall six years ago, when our Ecumenical Patriarch visited Cuba to officiate in the inauguration of the Holy Temple of Saint Nicholas, there were only four Orthodox Cubans, whereas now, more than one thousand Cuban families have been baptized and have embraced Orthodoxy. And every day, there are more - many more - who seek to acquaint themselves with the Faith of our Fathers. Six years ago, with the inauguration of Saint Nicholas' Church, the first Orthodox Community in the land began to function. Now, with the grace of God and the untiring labors of our five priests (one Colombian and four Cuban), some very significant and impressive missionary work is under way in three other cities of this Land. And this, in spite of unfavorable and financially difficult conditions. At this very moment that I am writing, the Hierarchal Commissioner of Cuba, Fr. Athenagoras, is in Greece trying to secure vestments and cassocks and chalices for our needs there. Even though the Cubans have given us the exceptional privilege of acquiring our own property (something that is not permitted by their Constitution), unfortunately, there are no funds for us to purchase a suitable building with the necessary thirty-five thousand Euros, to convert it into a Temple for the worshiping needs of the neophytes. We are hoping for God's grace and are praying for a donor to be found. When I visited President Fidel Castro seven years ago, to obtain the official invitation with which he was inviting the Ecumenical Patriarch to visit Cuba, I thanked him for that courteous and hospitable gesture of his. I will never forget his response: "No, Your Eminence, the people of Cuba thank you and the Ecumenical Patriarch, for bringing Orthodoxy to our country." As in the eras of persecutions, when Christians used to live in catacombs in anticipation of the day they could freely worship the Triadic God, so it is with us here, in all of the countries of Central and South America; for entire decades, innumerable groups of people - who had abandoned the Roman Catholic church - were waiting for the embrace of Orthodoxy. One such large group in Guatemala knocked on the door of our Metropolis several months ago, asking us to accept them in the bosom of the true Church. I didn't know them. I didn't even know they existed. And indeed, in this vast region of the twenty states under the jurisdiction of the Holy Metropolis of Mexico it is impossible to know everyone. However, twenty years ago, they had established their own (anti-canonical) Orthodox Church, naturally without knowing full well what they had done, and had endeavoured to survive. They lived incorrectly, in their own particular manner, an "orthodox" worshipping life. They knew and they desired Orthodoxy. They knew that our Church has the true faith - that they had a right to Orthodox teaching and its way of life. They believed that only there would they find the Saviour and Redeemer Christ. So, for twenty years. they walked along a path with the hope that they would eventually reach the truth. 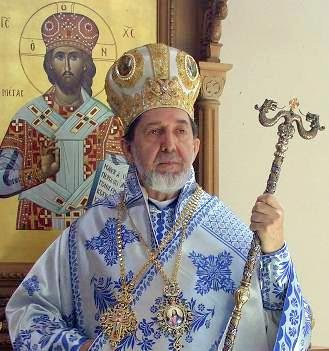 Knowing also that it was imperative to commemorate a Bishop in all of their liturgies, during the last ten years they would commemorate our Ecumenical Patriarch. Twenty years later came the "fullness of time". After searching, they learnt a few months ago that in Mexico there is a canonical Metropolitan and a Metropolis of the Ecumenical Patriarchate of Constantinople. They found me, and they knocked on my door, asking me to receive them. I sent two priests to go and meet them so that we could determine who they are and if their request is serious and valid. I was stunned. It was a "group" of more than 500.000 people, with 338 churches and chapels, most of whom were natives of Guatemala - and in fact of the ancient race of Mayans! They live in the mountains and the vast plains of the land and even in the southern cities of Mexico. I crossed myself and gave thanks to the Holy Mother for that miracle. I fully understood now what the great byzantinologist and historian of the previous century - Steven Runciman - meant, when he wrote that "the third millennium belongs to Orthodoxy". Now I also understand the words of a noble Mexican, a University Professor and a faithful member of our Church, when he said to me: "Your Eminence, Orthodoxy is like a shoe that fits us Latin Americans, provided you know how to put it on us." So I accepted that group and as a first step, I ordained the two leaders of the group. Now begins the long road of catechism for the hundreds of thousands of those people. It will require several years and a lot of hard work - but a blessed work - to teach those new faithful of ours what the Orthodox way of life involves, and how each of us experiences his own path towards Calgary, which leads to one's personal Resurrection. By training suitable indigenous clergymen, they will learn to live the worshipful life of the Orthodox Church and, after being baptized and receiving Holy Chrismation, to receive the Immaculate and Sacred Mysteries (Sacraments) - the Body and Blood of our Lord and Redeemer Christ. You must realize however, that for all this project that is now unfolding before us, we need your help. We need the necessary financial means to send our own priests to Guatemala, to instruct the catechist teachers there how to catechize the faithful. The financial means are necessary, in order to print hundreds of thousands of catechist texts, for children and for adults. In the meantime, many of those people are illiterate. 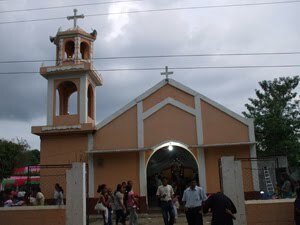 Money is also needed, to prepare videotapes in Spanish, and even in the local dialect of the Mayans, so that they might familiarize themselves with the Divine Liturgy, the Baptism, the Chrismation and all the Services of our Church. Can you imagine what this means for Orthodoxy? And this is just the beginning. The struggle has only just begun. We truly "own" Latin America. The third millennium truly belongs to Orthodoxy. With the meagre means at our disposal, but with the wide-open, vast and endless Grace and presence of the Holy Spirit, we will continue with our endeavours. We do however ask for your support. As I outlined above, we need a donation of thirty-five thousand Euros for the purchase of the property in Cuba, where we will establish a Temple and areas for the congregating and the catechizing of the faithful. 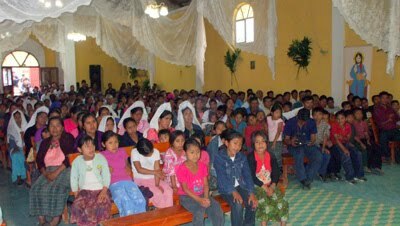 We will also need another donation of twenty-five thousand Euros, in order to begin catechizing the new faithful of Guatemala: to print catechism texts, prepare videotapes of Divine Services and to send suitable priests of ours to that Land, in order to undertake this very important work. It is our belief that the Missionary Association "Saint Kosmas of Aetolia", which has been the main support of our labours and our endeavours all these years, as well as all you pious donors and the members of the Association, will support us in this new venture that God has placed before us. The Lord God lives, for all eternity!